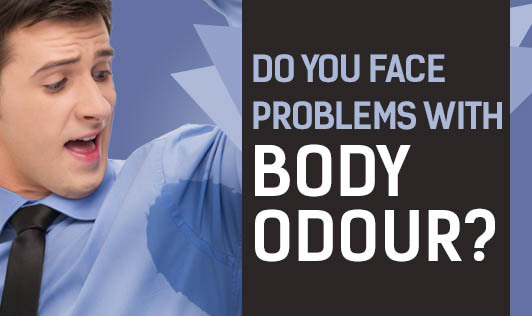 Do You Face Problems With Body Odour? Body odour is an embarrassing situation that a few of us may experience. It can put you in an awkward moment at your work place and have social implications if left unchecked. Body odour results from bacterial growth that occurs as a result of the secretion from sweat glands. There are many physiological reasons for the sweat glands to produce more sweat including diet, mood, medical conditions and hormone levels. 1. Drink plenty of water. This helps to dilute sweat and urine, both of which contribute to body odour. 2. Include whole grains, green leafy vegetables and fruits which provide high fibre that helps remove wastes from the body and cleanses the digestive system. 3. Avoid high amounts of pungent foods like garlic, onions and also red meat as it may aid in producing more body odour. 4. Wear light coloured, loose cotton clothes to soak sweat and deflect sun rays. Body odour lingers on clothes, so wash clothes after every use and avoid polyester fabrics especially in summer. Change socks and undergarments daily. Clothing made of cotton and linen is more absorbent and is able to soak in sweat better. 5. Bathe regularly and if possible, two times a day. It is very important that you bathe after working out or playing any sport. 6. Underarms tend to accumulate more sweat. Removing hair from underarms can help to prevent sweat rings. 7. Deodorants do help to mask body odour. There are some people whose body odour is too strong and deodorants and perfumes do not work on them. also, for some with sensitive skin, deodorants can cause skin irritation. In such cases, use antibacterial soaps. Talcum powder also helps to absorb sweat.